Interfaith Art Exhibition Biennial is the signature program that the Islamic Cultural Center of Northern California (ICCNC) coordinates and hosts with partners Montclair Presbyterian Church and Kehilla Community Synagogue, also both in the Oakland area (the three institutions make up the “Faith Trio” initiative). These exhibitions symbolize our commitment to the arts and to interfaith relationship building. They feature mainly the work of Bay Area artists and some national and international artists coming together to showcase compelling artwork while furthering interfaith understanding and respect. This project was initiated by Reza Rohani, former Executive Director of ICCNC and Lea Delson, active member of Kehilla, in 2011 and made possible by the support of the Faith Trio. For the past six years the Faith Trio has been leading the Interfaith Art Exhibitions and growing them into one of the major art programs in the Bay Area toward building interfaith dialogue and acceptance. The 2015 exhibition “We Are the Bridge” builds on the success of an inaugural interfaith art exhibition in Fall 2011 “Diverse Visions of Harmony”, and a second one “Finding Common Ground through Sacred Words” in May 2013. From the 2011 exhibit to the 2013 one, we increased the number of artists and artwork represented, from 40 artists to 100 (a 150% increase). The number of artworks increased as well, and in 2015 we have again featured a range of art modalities and artists representing many faith traditions. Art and culture are what keep the Islamic Cultural Center of Northern California (ICCNC) alive. ICCNC embraces a representation of Islam that celebrates artistic expression, cultural diversity, and education. We are very grateful to have seen our Art and Culture programs strive and flourish over the past few years. We host many art exhibitions, workshops, theatrical performances, film screenings, book readings and more, in hopes of bringing compassion, unity, and justice to our society - particularly important at a time when negative stigmas engulf Islam and all that is associated with it. 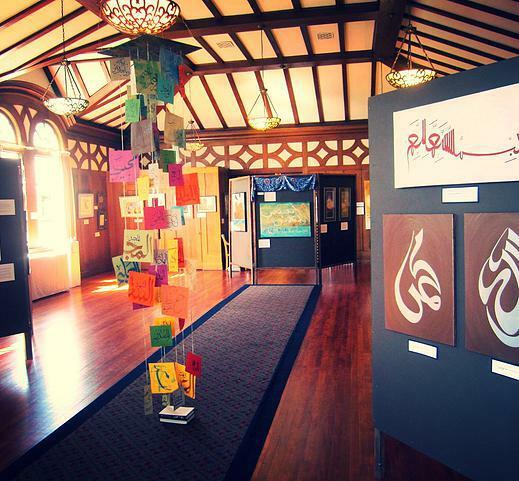 It is a great honor for us, the Islamic Cultural Center of Northern California, to host the ‘Interfaith Art Exhibition’, a testament to the artistic engagement within diverse communities and to the creativity of these artists in revealing their rich history, faith, and culture as well as their passionate impulse toward peace and sympathy. This program is a particularly good match with our mission, which is celebrating Islam through art, culture and education. Moreover, our partner organizations share the values we celebrate, notably a commitment to interfaith understanding, coexistence, and cultural exchange. Based on our prior experience we have already witnessed the power of an interfaith art exhibition to make a strong impact. It attracts the attention of a diverse range of Bay Area artists, and increases their reach. It draws in more audience members than any other interfaith project we have done, with almost 500 attending the receptions alone, and more visiting during the course of the exhibition. In 2013, 94% of attendees gave it a ‘very satisfied’ rating, the highest on our survey, and called it ‘inspiring’ and ‘exceptional.’ It attracts volunteers from all ‘Faith Trio’ partners, and brings in a variety of co-sponsors. It attracts funding from various foundations, and is of interest to our City of Oakland representatives and local neighbors. Jews, Christians, Muslims are all "people of the book." Each of us comes from a tradition of holy Scripture. A book is an assemblage of words, words assembled to convey a meaning. Words themselves are an assemblage of sounds to convey meaning. So if we are people of holy books, then we are people in search for meaning -- people who affirm that there is meaning to our existence and a purpose for us in the world and that we have the power to discern that purposefulness. In each of our traditions, our stories of the creation begin with a God who speaks the world into being. The Jewish philosopher Philo of Alexandria used the term "the divine logos" or the God-word to describe the vehicle by which he believed God transformed the idea of the universe into the reality of existence. The rabbinic commentary on Genesis, Midrash Rabbah, plays with the idea that the primordial Torah was God's blueprint of creation. While our traditions warn us about anthropomorphizing God, the reality is that these descriptions of God's creative process cannot but help bring up the image of God as the author of existence, or its artisan or its architect. So when we utilize our creative skills and turn our ideas and visions into writings or into concrete objects that convey meaning, we then become partners with God. Psalm 133 says "This is what is good and lovely: a gathering of kindred together." So here we are a gathering of artists, a gathering of communities, and how lovely it is. Kehilla, Montclair Presbyterian and the Islamic Cultural Center have been gathered together in what we call a Faith Trio for eight years. We affirm that we need to hear each other's words which convey our aspirations and thus discover that the other is not too distant from us, that we can be friends and that we can share our traditions, our cultures – even as we continue to follow and affirm our own unique pathways to truth. In a world spinning us centrifugally apart from each other, our centripetal defiance is subversive. We affirm that peace and justice are possible and that friendship and cooperation between Muslims, Jews, and Christians is most good and lovely. And at the risk of belittling the subject matter of this exhibition, this is not mere words. So referring here to the Gospel of John let me conclude by saying that in the beginning there was the word, but then there was us. And the words have never stopped flowing ever since. Long may they continue. To collect, curate, and exhibit art gathered from artists of various faith backgrounds is important. Interfaith dialogue--with all it offers in they way of friendship, understanding and healing--reaches across ancient fracture lines in the human community and begins the work of healing. Art brings creativity to the project of interfaith dialogue. It challenges us to think about ourselves and each other differently and it gives us fresh perspectives so that we see the world, with all of its beauty and brokenness, in new ways. In a fragmented world the work of interfaith dialogue and the work of art become vitally important. When the drumbeats of war beat out a constant ostinato for the music of our lives, when we are separated along the lines of race and class, when our ideological inclinations cause us to fear those who are different, we need to reach out to each other and to engage one another. And when we can work together to forge beauty, when creativity leads to new ideas and when art inspires innovation then we are living in the company of the righteous in the image of the God who creates and redeems the word and who calls us to live together in beautiful peace.